Pewsey Male Voice Choir: Season of Gigs and Mellow Tunefulness! Season of Gigs and Mellow Tunefulness! The last quarter of 2014 sees our Calendar quite nicely full starting with a return to the Burbage Village Hall on Thurs 23rd Oct as the support for Smile!Smile!Smile! a special WWI Commemoration Concert by the Blast From The Past historical singing troupe. 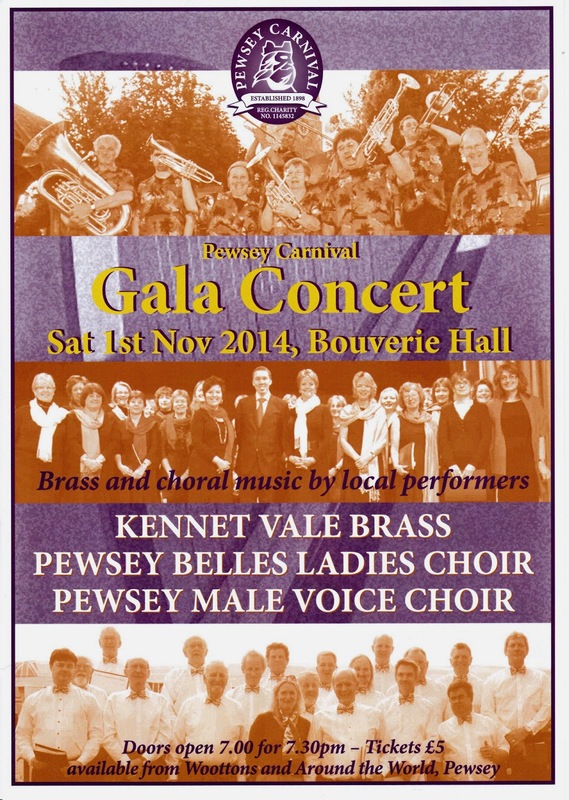 Then we join with long-time friends KV Brass and the Pewsey Belles for the annual Pewsey Carnival Gala Concert on Sat 1st November in the Bouverie Hall, see poster below. The year will be rounded off by a hectic schedule of Christmas events, highlighted by supporting KV Brass at the Macmillan Nurses Christmas Concert in Marlborough Town Hall on Sun 14th December. As ever, there will be a warm welcome awaiting anyone wishing to join in the fun, because we really can't have too many singers to enable us to carry out what we do ... you don't have to read music, you don't have to sing solo and you won't be judged! ... just beat a path to The Crown, Wilcot Rd any Monday 7:30-9:00pm (we use St.John's Church in the 2/3 weeks leading up to our bigger performances).